Their governments might not be ready for talks, but that did not stop Pakistan's Mohammad Basheer opening his heart, and his wallet, to ensure India's most recognised cricket fan Sudhir Kumar could be at the Asia Cup. 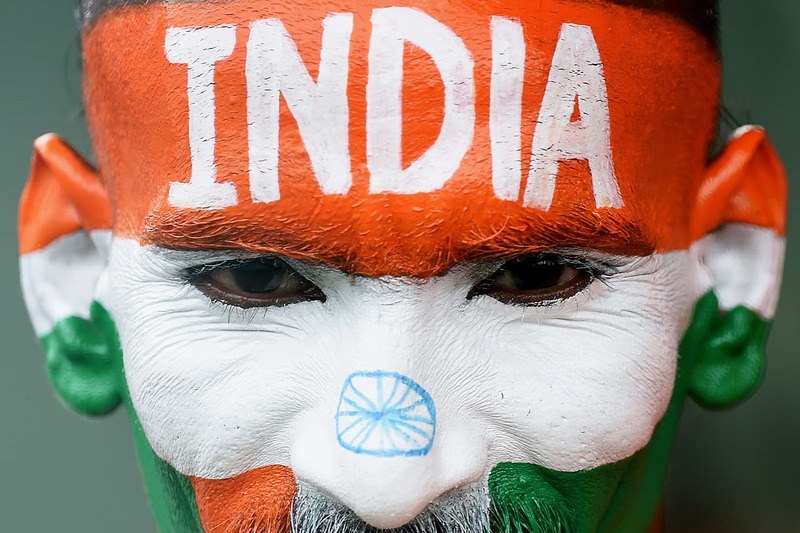 The 37-year-old Kumar, from Muzaffarpur, Bihar, has travelled all over the world supporting India but was resigned to missing the tournament in the UAE, which concludes this week, after his childhood hero and sponsor Sachin Tendulkar could not be reached in London. “I called Kumar to ask when he is coming to Dubai for the Asia Cup,” Basheer told AFP. “But I found him a bit disheartened because of no sponsorship, so I paid for his ticket and stay in Dubai,” added the Chicago-based Pakistani. Basheer's kind gesture brought the two together, sharing a room in India's team hotel in Dubai. Unfortunately for Basheer, his gesture meant also that Kumar twice saw India beat Pakistan in the group stages of the regional six-team showpiece. And although Pakistan missed out on Friday's final after losing to Bangladesh on Wednesday night, Kumar will be there to support India against the Tigers, as will his old friend from across the border. Kumar first encountered Basheer during the 2011 World Cup on the sub-continent. The pair became firm friends and have been getting together at India-Pakistan matches ever since. “I owe this tour to Basheer who has shown that friendship has no boundaries,” said an elated Kumar. Cricket's fiercest rivalry charges up fans from Kolkata to Karachi and millions from all over the world. Basheer said nothing compares to an India-Pakistan match and admitted to slightly split loyalties. “My wife is from Hyderabad Deccan in India, so I support India because of my wife and Mahendra Singh Dhoni, and Pakistan because it is my country of birth,” said Basheer, who runs a restaurant in Chicago famous for Biryani — a spicy rice dish popular on both sides of the border. Dhoni, the former Indian captain who still stars as a wicketkeeper-batsman in the one-day side, often gives Basheer match tickets. Kumar said he was happy to remain a bachelor because he was already “married to cricket”. When India won the 2011 World Cup, Kumar was invited to the dressing room to have a picture with the trophy — his greatest honour. 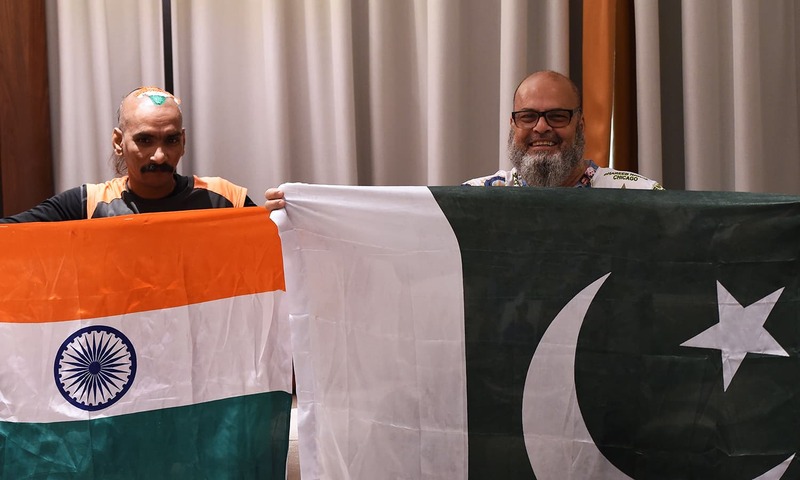 “I can't forget the Pakistan tour for the love and following I received,” said Kumar, who spends hours decorating his head and body with enamel paint and carries an Indian flag to every venue. Basheer too gets a warm reception every time he tours India, the last being in 2016 for the World Twenty20. “People-to-people love exists, no matter what happens at the top level,” said Basheer. India suspending cricket ties with Pakistan in the wake of 2008 Mumbai attacks hurt both Basheer and Kumar. “India and Pakistan not playing each other in their countries is sad and I always pray that relations get back to normal so that we can play each other,” said Basheer, who can sing a great repertoire of Bollywood songs. Kumar hopes cricketer-turned-politician Imran Khan's elevation to Prime Minister of Pakistan will pave way for a revival in relations at a sporting level. "I have high hopes with Imran," said Kumar. "I await the day when we play each other in their country... that day will come." Nice read. This is what we (Pakistanis) want. Good ties with our neighbors. I've made a few Indian friends through social media and not even for once I feel like as if they belong to any other country. We both share same set of joys & sorrows. Very kind gesture of Basheer. Much appreciated by an Indian fan. @Abid Shah It is natural to feel as brothers, because that is the fact. Just the land is divided. Basheer is a man with big heart. Nice to see such things. I always believe that the people living other side are equally good. Often I start thinking about touring Pakistan but this did not happen as often friends start scaring as if I m planning to a land of no returning back. I m perplexed , in Europe they have removed boundaries, whereas we are creating new hurdles everyday. Hats off to both these passionate cricket lovers. It is difficult to match their love for the game. Good gesture by Mr. Bashir. He's a good man! Very good. My respect for both of them. Sports were meant for entertainment, let us not make them a source of stress on our minds. Nice example between this Neighbors Nation India & Pakistan and also thanks to Dawn for beautiful images at Dubai hotel. Imran khan govt want to talk with India but India refuse to talk with Pakistan. It's India refuse to talk with Pakistan. Pakistan want peace. Talk is only way to make peace. These are very heart-warming photographs. Such a treat to watch these super-fans and their personal bonding. Hoping we have great relations, communication and loving bond between Indians and Pakistanis. Hopefully one day we can have a no-visa policy just like in Europe. People can live, trade and do business where ever they want. And it's not we will lose our identity that way. We can always keep our culture and identity. I'm a proud Karachiite and will always be one. I have tons of Indian friends. When the game is on, they are my biggest rivals and I love Pak to beat India if no one else as it's a sporting rivalry. When the game is over, they are my brothers and my closest friends and I don't care what race, ethnicity and part of the world they come from! Beautiful article! Why doesn't Indian media publish such articles which show brotherly love between people of the two nations? We need people like Kumar and Basheer in India and Pakistan. We have too many small-minded people on both sides of the border and this should be a lesson for ALL of them. Let us stop beating the drums of our governments. Basheer, I love you, brother, as you have made all of us Pakistanis proud. We need more people like you in Pakistan. Kumar, I love you too, brother, we need more people like you in India. I have tears in my eyes writing this message. No Indian would feel more at home anywhere in the world other than Pakistan. Similarly, no Pakistani can feel more at home anywhere else in the world, other than India (I have personally experienced it a number of times). We know Mr. Bashir with his last name and he also has a nickname. I met him at a wedding party in Pasadena Los Angeles at one of his close friend's house with many other friends from Pakistan, him and all previously from the Misquita Lane, Newtown, Jamshed road area in Karachi. I found him very whole hearted, amusing and funny. Throughout he joked around and constantly teased by his friends, He is a 24 hr business owner in Chicago area and is well known in the community. This is Awesome, this is what we need more of. I have many Indian friends and truth be told, we hardly ever talk about Pakistan and India, we are so involved in our own lives and families. I believe this make believe hatred we have for eachother is fading and the future of Pak Indo relations is going to be great. I have become a huge fan of Hitman Rohit Sharma. Will be watching his batting in the finals. Very nice gesture from the Pakistani fan. Wish the two governments were also as sincere and honest in dealing with each other. Kudos to both the gentlemen. Very nice story. If we are together we dont require any other nation to built our own country...And whole world knows this... thats the reason they want us to remain hostile towards each other & they can take advantage of the situation and use us against each other... to pocket all the profit from it. Loved it when Basheer chacha supported India in the final by wearing Indian jersey. You will be treated as an Indian should you ever visit India.